If you follow me on Instagram or Twitter at all, you probably saw my tweets/Instagram post about my younger sister, who just graduated highschool last week! I'm so proud of her, as she is now a freshman at San Jose State University starting this fall. Before coming to college, when I went to high school and middle school graduations, people would go CRAZY when it came to getting their graduate lei-d (get it? haha). Trust me, my sign of my sister was not that bad (or big) compared to others. 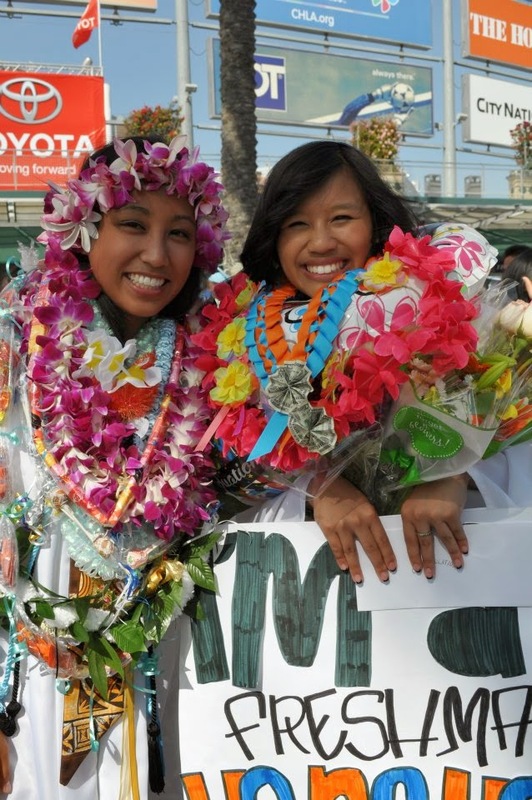 Throwback to when I graduated high school with my Filipino-Hawaiian sister! 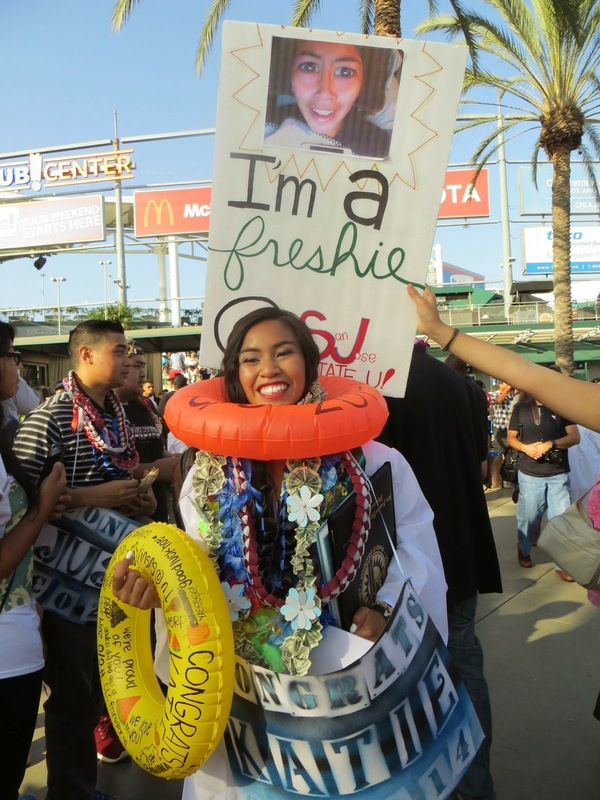 Friends and family of the graduate would print out larger than life posters of that person's face, they would blow up floaties, they would create leis out of chips or ramen packs, and Pacific-Islander families typically created elaborate money crowns for their grads. All of this, on top of the candy, flower, and ribbon leis, graduates from where I'm from would be covered in leis, so much so that sometimes you can't even see the bottom half of the person's face. When I got to college, I'll be honest and say I Facebook-stalked a lot of my new college friends (don't act like you never have!) and of course stumbled upon many of their recent graduation photos. Most of them weren't covered in leis, and they'd be lucky to have more than two. "Is it a Filipino thing to get covered in leis at graduation?" I wondered, why is it that Asians and Pacific Islanders are typically the ones who go crazy like this at graduations? I grew up in a heavily Asian/Pacific-Islander community before college, so if non-Asians were doing it, it was typically out of influence from the Asians/PI's. If I ever see people at schools where it is not predominantly Asian/PI, the people who got lei-d were Asian/PI. To be honest, I'm not really sure, but I can make a few guesses. They're just really proud of their accomplishment. They might've just been so happy and wanted to go all out for them. Simple as that, and completely understandable. More understandable for college especially. They're very creative. If you see some of the posters and leis people make for their loved ones, so many of them are soooo nicely done and neat. For many people, they're just really creative and making beautiful signs and banners are just part of their natural way of expressing themselves. They want to show off their graduate and their pride for them. This is pure pride. Not in a bad way, but pride as in they want to represent their graduate and show everyone that they did it. They want to show everyone how much they love them and how awesome they are for graduating. That's why if you go to a graduation in my hometown, everyone and their mom is almost having an unspoken competition for which family can be the craziest and loudest for their grad. It's cultural. I don't ever remember learning about all the leis and stuff being cultural for Asians, but for Pacific Islanders there are the shell necklaces, the intense islander crowns and all that good stuff. It may be cultural for them to celebrate that way, but I'm not too sure. What do you think? Does your family do this? Are you not Asian/PI and your family still does this? I might talk more about this in a Youtube video sometime soon or graduation season next year because I think it's such an interesting phenomenon. GIVEAWAY WINNERS: So if you entered my blog's anniversary giveaway, I announced the winners on the Rafflecopter widget already! Did you win? And even if you didn't, thank you so much for entering! I'm not Asian/PI and we don't do this, but my Filipina roommate does! I think it's cool...but I think the Swedish tradition of wearing a white dress and a sailor hat is even cooler, lol. I always wondered where the tradition of being lei-ed came from. several kids i graduated high school with were given leis and that was 10 years ago. Wherever the tradition came from, I think the fresh flowers are absolutely gorgeous! Congrats to your sister! What an amazing accomplishment! My sister just graduated from high school too. Filipinos are definitely notorious for parties, that's for sure. So I completely understand where you're coming from. We don't do leis, but we do do parties. My mom always has to recruit friends to help, and there's always a whole pig and way too much alcohol and, of course, karaoke! My sister in law is from Hawaii and celebrates all the traditions and keeps her culture alive where she stays. I'll have to ask her is there a significant meaning for it all or not. I have never seen this before but it is awesome! My graduation was totally lame compared to this. No type of gifts or signs were even allowed other than flowers.